Network Attached Storage - Simplified! As the amount of unstructured data continues to soar, managing this content has become overly complex and expensive. 30-year-old RAID-based strategies are not a scalable solution for the future. Organizations of all sizes need to reevaluate their storage strategy for both primary and data protection storage. Next generation solutions designed to easily scale capacity and performance are a must to support ever-changing business requirements. Data is growing at a dramatic rate and so is the requirement to protect and retrieve it across multiple environments. Current backup solutions are failing IT in keeping up with the demanding RPO/RTO (Recovery Point & Recovery Time Objectives) within diminishing backup windows and require forklift upgrades as they reach capacity. Is it possible to reduce the pain and cost of backing up this avalanche of data? 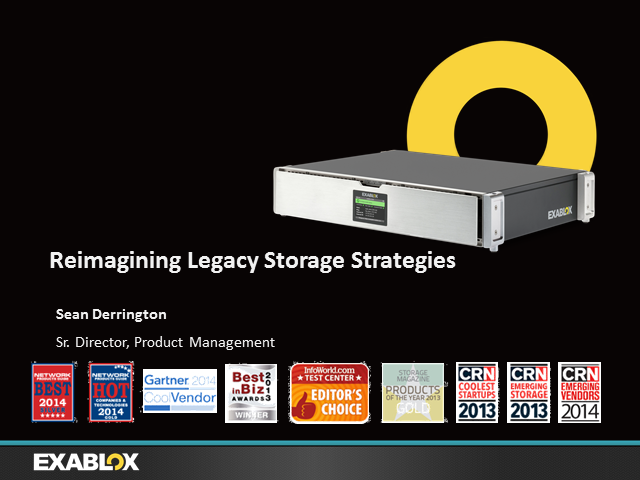 Join Sean Derrington, Senior Director of Products at Exablox as he discusses new strategies and technologies to store, backup and retrieve this critical data – while eliminating inefficiencies, bottlenecks and failures associated with legacy backup solutions. Digital information is growing at a staggering 50% per year and its severely impacting organizations. In an effort to retain, protect, and retrieve this information, IT has spent a disproportionate amount of budget, people, and bandwidth into weathering this storm. But how sustainable is this effort? In this session, Tad Hunt, CTO of Exablox will take a close look at how current storage strategies and solutions can’t accommodate this escalating problem, and how a new approach combined with next -generation technology is ultimately the only way to survive. In the era of unyielding data growth rates, it’s assumed that storage will be costly, cumbersome to manage, and sap your personnel resources. Storage designed to be the foundation for business growth is often crippled by its inability to perform and scale under new, and unpredictable, business demands. Is it all doom and gloom? In this session we will take a closer look at the solutions that are failing IT organizations in today’s environment and the emerging technologies that are delivering the promise of reducing the cost and complexity of running an enterprise scale-out storage infrastructure. In this video, enterprise storage writer, speaker and blogger, Stephen Foskett discusses today’s storage challenges and how the shortcomings of technologies have led to a leap in innovation from new solutions. He discusses how technologies such as RAID, the bedrock of many enterprise solutions, are becoming obsolete as the threat of big data encompasses organizations of all sizes. He takes a close look at emerging storage technologies such as object storage and provides his opinion on what to consider when building a scalable and flexible storage solution. Unstructured data is growing at alarming rates across the enterprise. Managing and protecting that information is paramount yet with legacy RAID storage architectures, this task is daunting at best. Providing ubiquitous SMB access to storage through scale-out storage, enabling multi-tenant storage management across locations, providing de-duplication for primary and disk-based backup, and seamlessly growing storage capacity in real-time used to be impossible criteria for a single storage vendor. Join us and learn how to leverage a next generation object based storage architecture to achieve what individual point products alone cannot.